The flag of Spain consists of three horizontal stripes with red on top and bottom, yellow in the center. The coat of arms of Spain, featuring the Royal Crown, positioned left of center on the gold band. The flag of Spain has horizontal bands of red across the top and bottom, each taking up one-quarter of the flag. Between the two red stripes, the flag is a thick golden yellow band, equal in size to both the red stripes together. Off-center on the yellow stripe of the flag, the Spanish coat of arms is featured, symbolizing the kingdoms of Spain. On the coat of arms are the arms and symbols of the various regions and former Kingdoms of Spain, including the Kingdom of Castile, and the House of Bourbon. The flag of Spain was adopted as the national flag of Spain on December 6, 1978. Long before the current flag's usage, Spain was divided into many kingdoms, which had their own flags or emblems that are now represented on the Spanish national flag. The color scheme was first selected by King Charles III, and the flag was first used as the naval flag of the country. 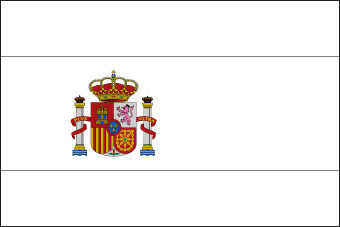 Queen Isabella II made the flag official in 1843. The Second Spanish Republic replaced the flag in 1931, incorporating a purple band into the design. After the Spanish Civil War, the red and gold flag, this time featuring an eagle, became the national flag of Spain in 1936. With the Spanish Constitution in 1978, the current flag of Spain was designated the official national flag of Spain. Design and Colors A horizontal tricolour of red, yellow (double width) and red; charged with the Spanish coat of arms off-centred toward the hoist.